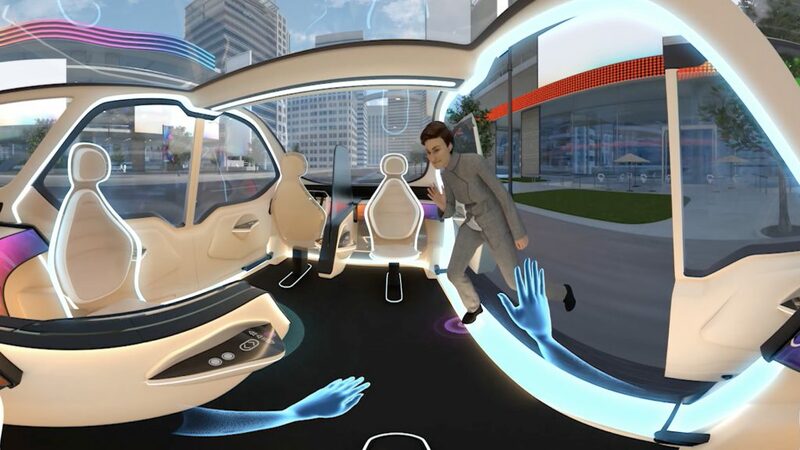 The automotive market is going through rapid and fundamental changes with autonomous driving, ride and car sharing and vehicle electrification. Covestro is a leading producer of advanced polymers and high-performance plastics in North America and around the world. 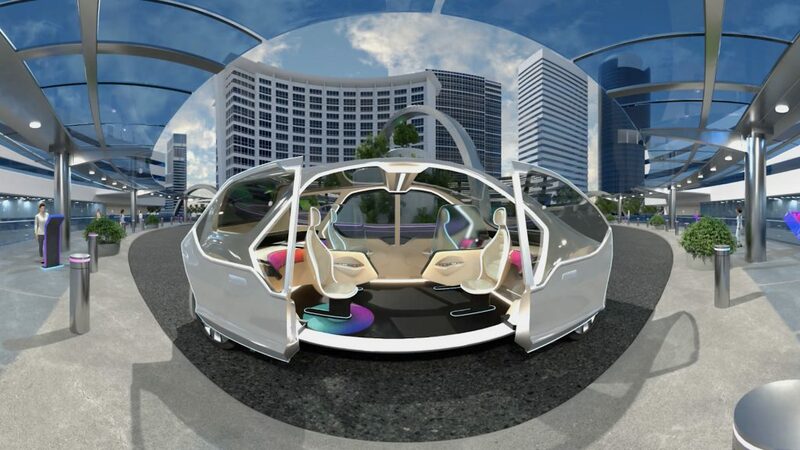 The company has been looking into the future of mobility to guide its development projects and ensure its automotive materials can meet the needs of tomorrow. Below is the taser video used prior to the launch event. Below is a link to the entire 360º experience that can be viewed on a web browser. 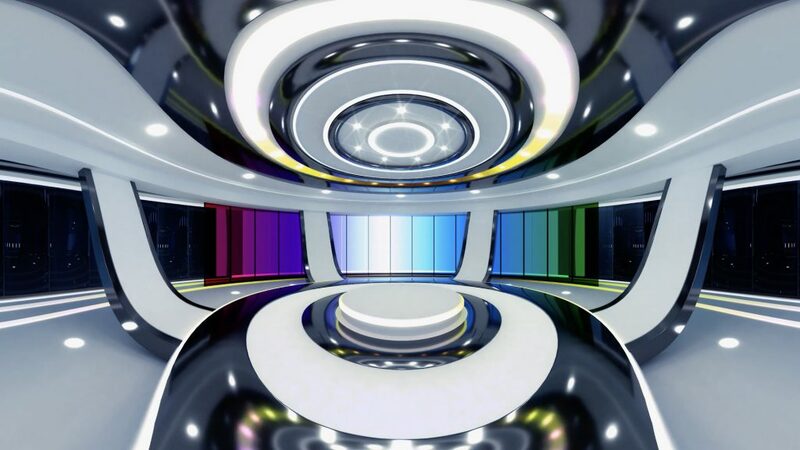 The original onsite experience is being viewed on Oculus Go headsets and can be seen stereoscopically. 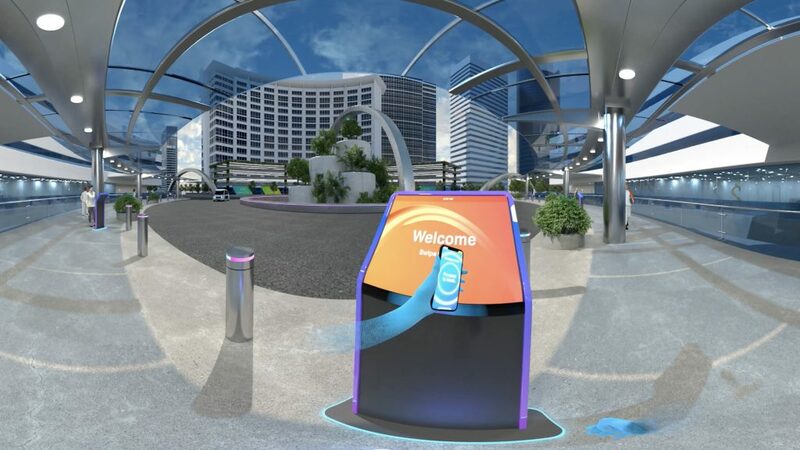 Groove Jones worked with the Covestro Future of mobility (FoM) team launch a new VR (Virtual Reality) experience that allows you to step into that future. 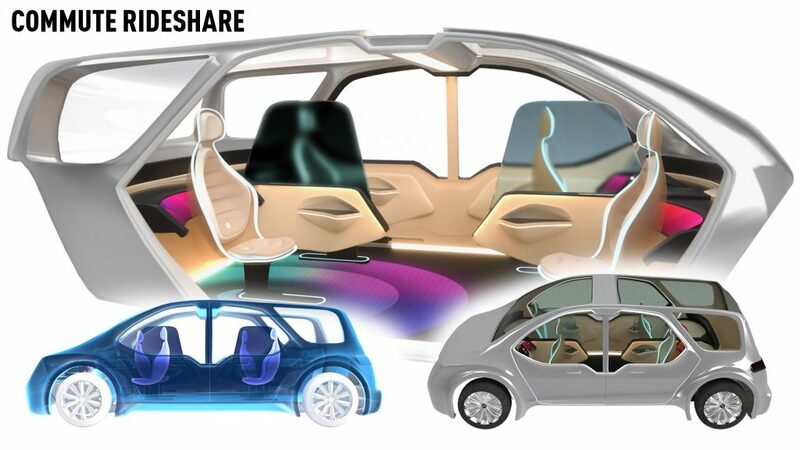 The Covestro team predicts that autonomous vehicles, electric vehicles, and vehicles built for ridesharing purposes will shift the focus from the driving experience to the riding experience, which will requiremore high-value material solutions for vehicle interiors. GrooveJones worked with the team to illustrate that story through a dynamicand interactive VR experience. Below is an overview of theproduction. 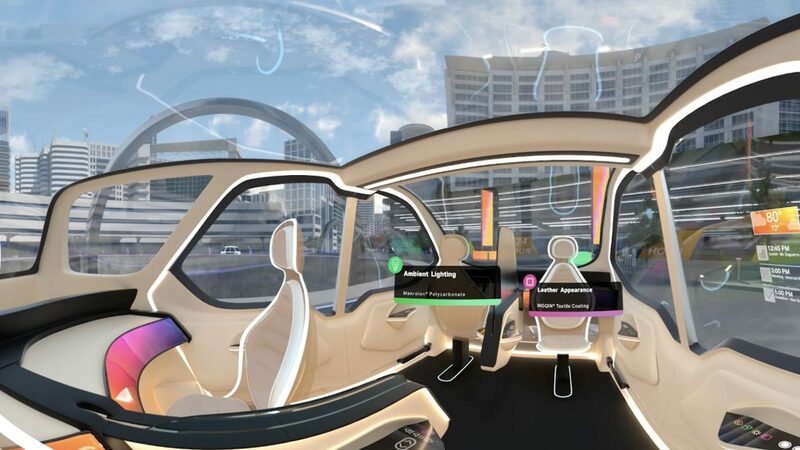 The Covestro team predicts that autonomous vehicles, electric vehicles, and vehicles built for ridesharing purposes will shift the focus from the driving experience to the riding experience. Groove Jones worked with the team to illustrate that story into a dynamic and interactive VR experience. Below is an overview of the production. 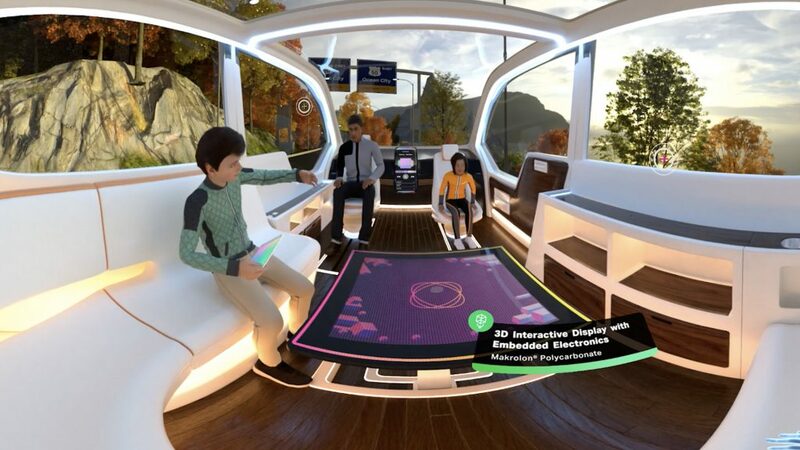 The Groove Jones team met with the Covestro Future of Mobility team to better understand the research and insights that the team had discovered. The future will be different than it is today. It portrays a world where the majority of the population doesn’t own a vehicle. 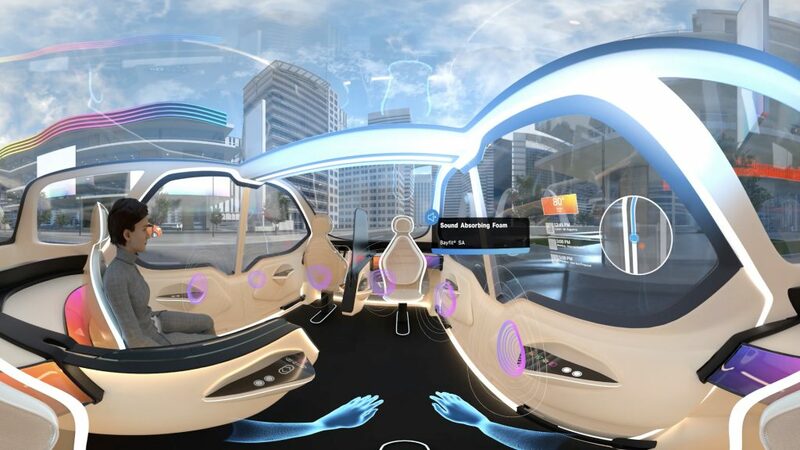 Where owning a personal vehicle will change and be replaced by on-demand mobility services, enabling fleet owners to add more high-value features on the interior because the cost of the vehicle is distributed over many riders. 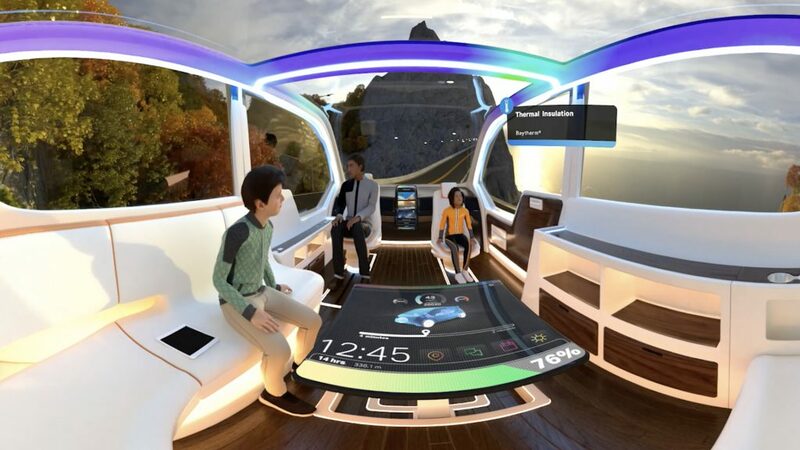 We needed to envision what life will be like. The production began with outlining the key beats around thestory that we needed to tell. The team then delivered a series of storyboardsto help visualize and time the story. 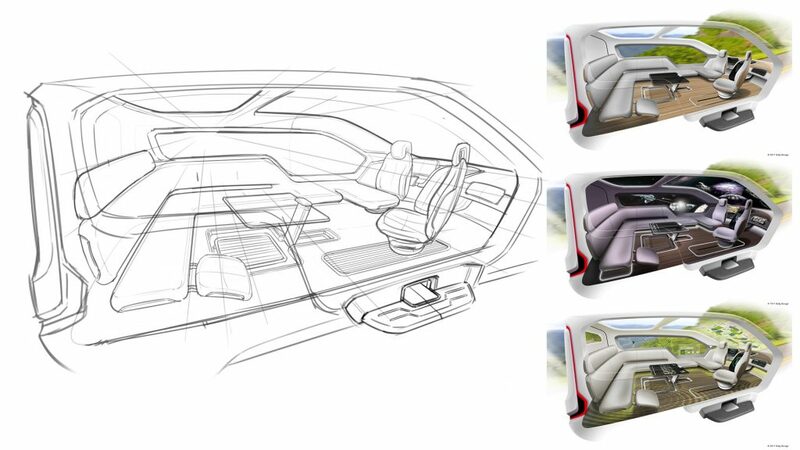 We discussed key areas of what materialswould be used both inside and outside of the vehicle. Once the storyboards and script were complete, we began to develop the visual stylefor the production. 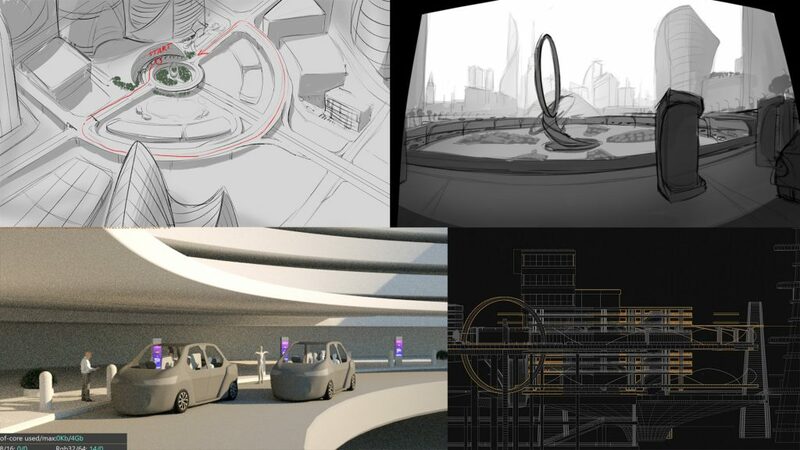 Key elements were the city, vehicles, props and characters thatwe would see in the year 2030. 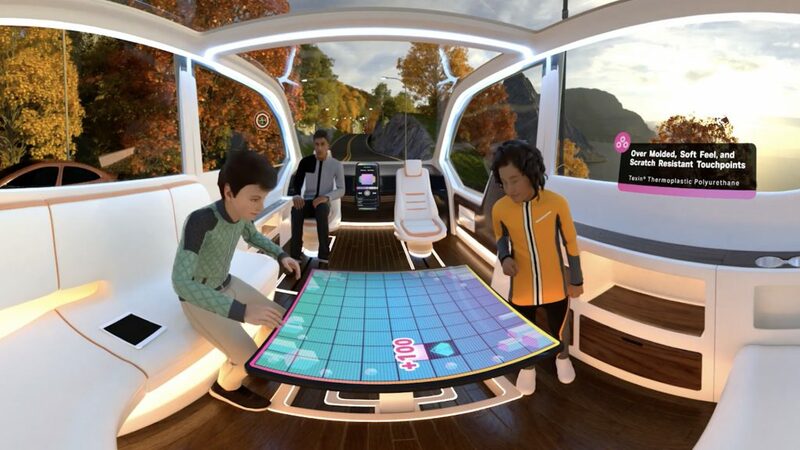 The VR experience explores the story of a traveler as he/she leaveswork to head home and then eventually head out on a family trip over theweekend. 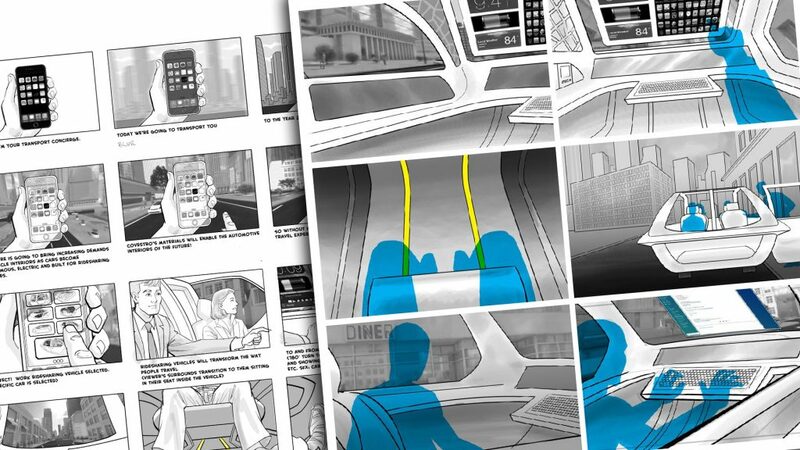 So the main vehicle that we focused on is a rideshare vehicle where wetake the user on their daily commute to work. Below is a shot as the vehicle pulls up to your home in order to take you to work. The second part of the experience showcases the type of vehicle for the shots with the family on a weekend getaway. Below is a shot of the interior of the vehicle that the family takes on the weekend. We needed to design the city and environments seen from when the user leaves their office and travels through the city and eventually into the countryside. Most of these scenes can be viewed through the oversized windows on the vehicle. Below is a final shot as the user leaves their office and orders the rideshare vehicle. In and around the city. Various people are seen in and along the ride. We needed to create a wide variety of people that you might encounter while sharing a vehicle. 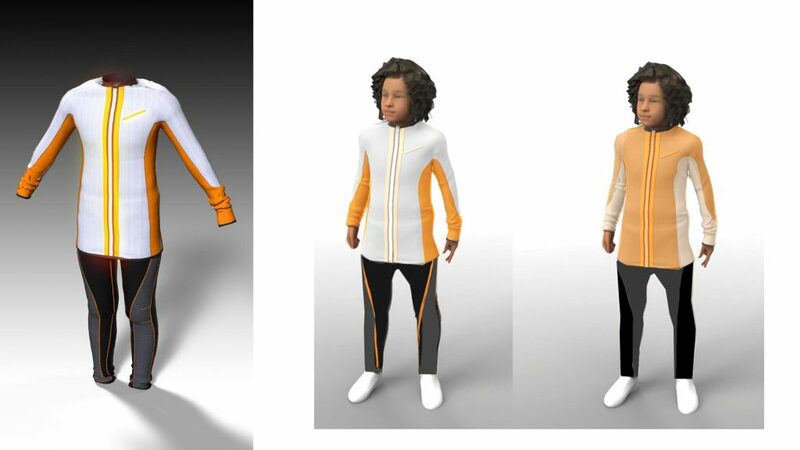 The team also needed to create the clothes that they wore. Each character was animated using various techniques, including our GrooveTech™Character Performance Capture platform. This enabled the team to capture our actors on-site at our offices and work through each scene in real-time. 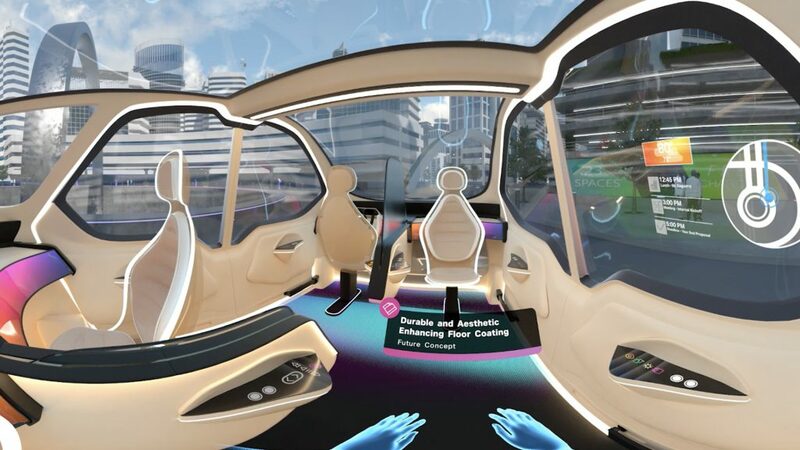 Covestro launched the VR experience on December 3, 2018, at its RoadTrip 2030 event, which was held at the Energy Innovation Center in Pittsburgh, PA. 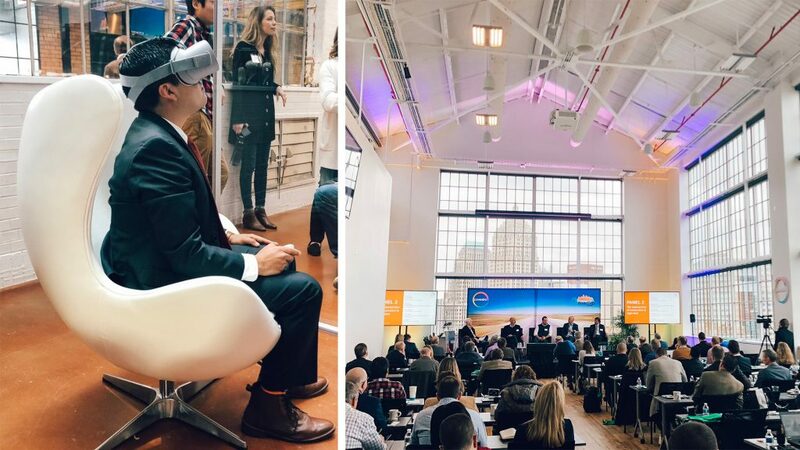 The event brought together innovative players that are leading the charge toward a driverless future – from automakers, suppliers and ridesharing companies to research, engineering and design institutes – to ignite, discuss and experience the future of mobility. Covestro is taking the experience on the road. 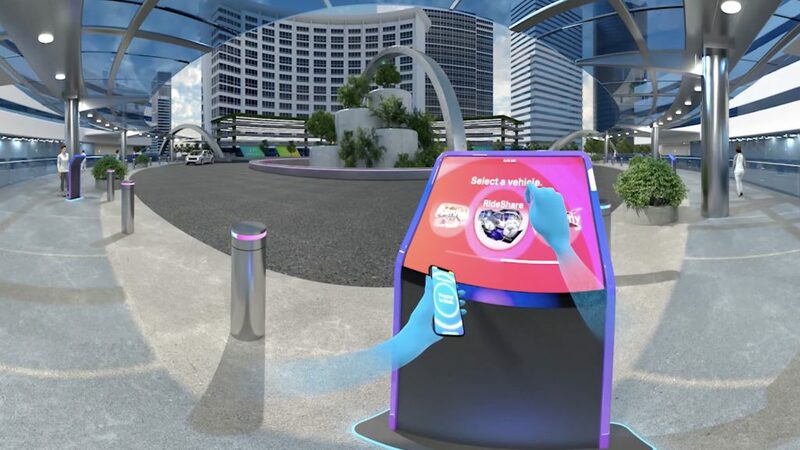 The will also be demonstrating it at CES on January 8 – Friday, January 11, 2019 in Las Vegas in the Covestro Booth #52934 and Auto Mobil-D on January 16-17, 2019 in Detroit in the Covestro Booth #AD03. The Future of Mobility (FoM) initiative is a North America (NA) cross-business unit enterprise launched by the Covestro leadership team to capture, synthesize, and act upon long-range industry trends at a company-wide level to guide their position on future mobility. Feel free to reach out to us if you have any questions about our capabilities and activation services. Follow us on LinkedIn or Facebook.